To Cite: Antony C D, Rahmat K, Vijayananthan A, Pailoor J. Rhabdomyosarcoma Metastasis to the Breast: Appearance on Diffusion-Weighted Imaging and Apparent Diffusion Coefficient Sequences, Iran J Radiol. 2017 ; 14(1):e13457. doi: 10.5812/iranjradiol.23273. Rhabdomyosarcoma is a common primary childhood malignancy that rarely metastasizes to the breast. We report a patient with a primary sinonasal rhabdomyosarcoma metastasizing to the breast, with no distant spread. We describe the imaging appearance of rhabdomyosarcoma on magnetic resonance imaging (MRI), particularly on diffusion-weighted imaging (DWI) and apparent diffusion coefficient (ADC) sequences. Rhabdomyosarcoma metastasis has a variable appearance on ultrasound and MRI, and may mimic common benign tumors. However, it appears hyperintense on DWI and produces a low value on the ADC, which may be more accurate for determining its malignant nature. The most common sources of extra-mammary metastases to the breast are melanomas, lymphosarcomas, oat cell tumors of the lung, and ovarian carcinomas (1). Breast metastases from rhabdomyosarcoma are rare, with an incidence varying from 1% to 5%, occurring mainly in adolescent females. The primary tumor most commonly originates from the extremities. These tumors are also mostly of the alveolar subtype (2). Bilateral involvement is between 8% and 25% (1). 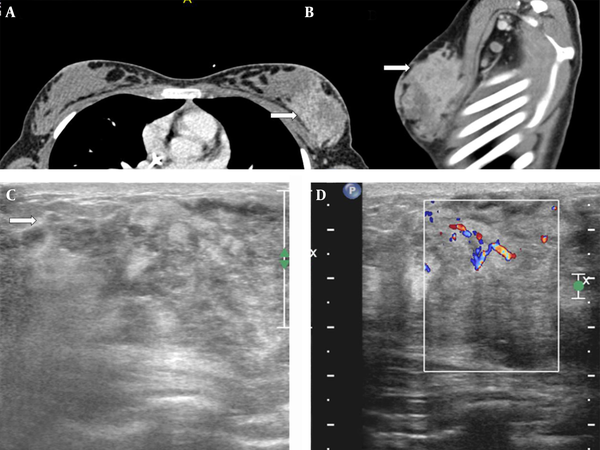 There are few articles that describe the imaging findings of rhabdomyosarcoma metastases to the breast on magnetic resonance imaging (MRI) (1-3). The variable morphological and enhancement patterns of benign and metastatic lesions to the breast on MRI suggest limited specificity of standard conventional contrast-enhanced MRI in differentiating malignant from benign lesions (4-6). Recent studies have demonstrated the evolving role of diffusion-weighted imaging (DWI) and proton spectroscopy in the characterization of breast lesions (7-9). We report a rare case of breast metastasis from a sinonasal rhabdomyosarcoma occurring in a 13-year-old girl, in particular describing the imaging features with an emphasis on DWI and apparent diffusion coefficient (ADC), which current reports have noted to be useful sequences in discriminating between benign and malignant breast lesions. A 13-year-old girl presented to the surgical department with a rapidly growing, painless mass in her left breast over the previous one month. On physical examination, there was a large (10 cm), round, hard, immobile, mildly tender mass located in the outer portion of the left breast. No axillary lymph nodes were palpable. One year earlier, the patient had been found to have embryonal rhabdomyosarcoma of the left maxillary sinus with local extension into the left ethmoid and frontal sinuses, associated with ipsilateral cervical lymphadenopathy. The patient underwent gross total resection of the tumor after four cycles of neoadjuvant chemotherapy. The margins of the resected tumor were not clear. Subsequently, she completed another five cycles of chemotherapy along with radiotherapy. The initial metastatic workup, which included a CT of the chest, bone scintigraphy and bone marrow biopsy, was negative. Blood tests were unremarkable. During this presentation, she underwent another computed tomography (CT) of the chest, which showed an ill-defined mass in the left breast with ipsilateral axillary lymphadenopathy (Figure 1A and B). Breast ultrasound was performed using a 12.5 MHz linear array transducer (Phillips IU22 Philips Healthcare, Bothell, WA, USA). This revealed a large ill-defined heterogeneous lesion containing necrotic areas and demonstrating increased vascularity (Figure 1C and D). Figure 1. A 13-year-old girl with history of embryonal rhabdomyosarcoma of the maxillary sinus presented with a rapidly growing painless mass in left breast. A, Contrast-enhanced CT of the chest (white arrow) shows a large heterogeneously enhancing mass occupying the outer half of the left breast on axial (white arrow) and B, sagittal (white arrow) images; C, Ultrasound of the left breast shows a large heterogeneous mass with poorly defined margins (white arrow); D, Color Doppler demonstrates increased peripheral vascularity. Subsequently, a biopsy of the mass was performed and revealed a rhabdomyosarcoma, which was cytologically identical to the primary lesion. The microscopic sections showed strips of breast tissue infiltrated by large nests of viable malignant small round blue cells. These cells were mildly pleomorphic, and demonstrated hyperchromatic nuclei with minimal cytoplasm. Numerous mitoses were seen with aberrant forms. The surrounding stroma was desmoplastic, with interspersed infiltrating strands and cords of these malignant cells and myogenin, consistent with tumor of rhabdomyoblastic origin (Figure 2). Figure 2. A, Sheets of round tumor cells with hyperchromatic nuclei and scanty cytoplasm. Lack of alveolar pattern. (Hematoxylin & Eosin staining, magnification ×200); B, Tumor cells positive for desmin. (Immunostain for desmin, magnification × 200); C, Tumor cells showing nuclear immunopositivity. (Immunostain for myogenin, magnification × 200). After the biopsy, the patient underwent another two cycles of chemotherapy. Due to her young age and the aggressive nature of the disease, head and breast MRI was used for surveillance and assessment of the treatment response. The examination was performed on a 3.0 Tesla MRI machine with a dedicated bipolar phased-array breast coil (GE Healthcare, Milwaukee, WI, USA). The pre-contrast series (T2-weighted and STIR) were acquired before the injection of the contrast agent. Axial T1-weighted 3D spoiled gradient-recalled echo pulse sequences were performed with the following characteristics: echo time = 2.1 ms, repetition time = 4.3 ms, flip angle = 10°, FOV = 36 cm, slice thickness 1.4 mm, and matrix size = 256 × 256 pixels. The dynamic contrast-enhanced images were sequentially obtained before, and six phases after, the administration of a 10 ml bolus of intravenous gadopentetate dimeglumine at 0, 60, 120, 180, 240, 300, and 360 seconds (0.2 mmol/kg of Gd-DTPA followed by 20 ml of normal saline). 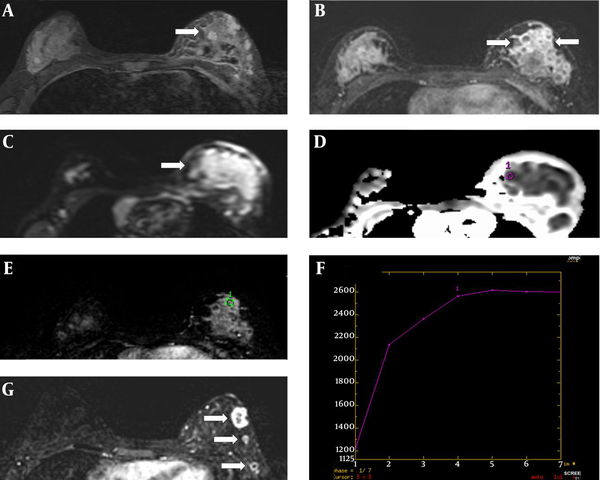 Breast subtraction dynamic contrast-enhanced MRI (BS DCE-MRI) scanning, performed before chemotherapy and two months later, showed marked shrinkage of the tumor. On pre-chemotherapy MRI, the lesion appeared ill-defined, with heterogeneous signal intensity on STIR images, and demonstrating heterogeneous enhancement on BS DCE-MRI. It measured approximately 4.5 (AP) × 2.8 (W) × 4.5 (H) cm (Figure 3A - E). On the dynamic images, there was rapid early enhancement with the arterial peak at 180-240 seconds after contrast medium injection, followed by flattening during the delayed phase (type II kinetic curve) (Figure 3F). There was also infiltration of the underlying pectoralis muscle. Follow-up BS DCE-MRI post-chemotherapy demonstrated multiple small and well-defined peripheral enhancing residual lesions, indicating a good treatment response (Figure 3G). The breast lesion demonstrated restricted diffusion on DWI and a low ADC value of 0.25 × 10 -3 mm2/s. Figure 3. Breast MRI. A, Axial STIR image showing a heterogeneous mass (white arrow); B, Axial image of early subtraction dynamic MR showing an ill-defined heterogeneously enhancing mass (white arrows); C, Axial DWI MRI showing hyperintense signal (white arrow); D, Axial section of the ADC map showing an ROI cursor (purple circle) placed over a hypointense area within the tumor (black arrow); the area calculated for the tumor had an ADC value of 0.25 × 10-3 mm2/s at a b-value of 1000 mm2/s; E, Dynamic curve with ROI (green circle) placed over the enhancing solid tissue; F, Dynamic curve shows a plateau (type II) curve. The curve reaches a peak during the arterial phase 180–240 seconds after contrast medium injection, followed by a flattening during the delayed phase; G, Axial image of early subtraction dynamic MR post-chemotherapy showed significantly reduced tumor size, with multiple well-circumscribed hypointense lesions demonstrating rim enhancement (white arrows). There are three articles in the literature that report the MR appearance of rhabdomyosarcoma metastasis to the breast. Birjawi et al. reported a case of an 11-year-old girl with breast metastases from a primary sinonasal tumor, which was described as showing an intermediate signal on T1-weighted images, heterogeneous hyperintensity on T2-weighted images, hyperintensity on STIR, and diffuse enhancement with central necrosis (3). Perlet et al. described breast metastases from rhabdomyosarcoma as well-circumscribed nodular lesions with early, rapid ring-like enhancement, with the largest lesion displaying very low signal intensity centrally, indicating necrosis (2). Wurdinger et al. also reported a similar early, rapid ring-enhancement followed by subsequent confluent enhancement (1). Interestingly, the tumor in our case displayed heterogeneous enhancement. Therefore, it is not always possible to differentiate malignant versus benign lesions on MR imaging, and the differential diagnosis in this case would include benign breast lesions, such as fibroadenomas, as well as lymphomas and metastases from other primary sites. In cases of metastases, MRI is useful in affirming their malignant nature, as they tend to exhibit a washout phenomenon identical to that of primary carcinomas. However, the specificity of conventional MRI in detecting malignancy is limited, as some benign lesions have features that are indistinguishable from cancers, including rapid contrast enhancement (4-6). In this case, the histologically proven rhabdomyosarcoma metastatic tumor demonstrated a type II curve with relatively rapid contrast uptake up to 180 seconds after contrast medium injection, which may be seen in some malignant lesions. Sen et al. (10) reported the accuracy of differentiating benign from malignant lesions based on size, morphology, signal intensity on T1- and T2-weighted imaging, and post-gadolinium appearance. Margin irregularity was the most specific indicator of malignancy, with an accuracy of 78%. The rest of the features described were only able to differentiate benign from malignant masses with an accuracy of 58% to 78% (11). Findings of benign tumors, primary breast carcinomas, or metastases may overlap on MRI, and histological tissue confirmation is usually warranted in patients with a known primary malignancy (4). In this respect, DWI and ADC sequences may substantiate findings of malignancy in lesions that exhibit a morphology and an enhancement kinetic curve that are suspicious for malignancy. The ADC of a tissue is expressed in units of mm2/s, with no unanimity regarding the boundaries of the range of normal diffusion, but ADC values less than 1.0 to 1.1 × 10 -3 mm2/s generally indicate restriction in diffusion (11). However, a study comparing the normal breast parenchymal ADC values with mammographic density, age, and background parenchymal enhancement revealed a strong correlation between mammographic density and ADC values, with ADC values increasing with breast density (7). Tan and colleagues found that the ADC values of malignant lesions were significantly lower than those of benign lesions, with the cut-off ADC value for malignant lesions being 1.22 × 10 -3 mm2/s for b = 1000 s/mm (8). Our study gave a low ADC value of 0.25 × 10 -3 mm2/s, consistent with a malignant lesion, which is consistent with Tan et al.’s report (8). Our case demonstrates the usefulness of the ADC value as a marker for breast malignancy, especially in young patients with dense breasts. A recent report by Bahreini et al. (13) in 2010 showed that the gradient vector flow (GVF) snake segmentation method and BS DCE-MRI give more diagnostic information about breast lesions, with a reported sensitivity of 81% for both methods and a specificity of 60% when the GVF snake segmentation method is used on the first series alone. They concluded that their method, if used correctly in addition to the DWI and ADC sequences, may provide better diagnostic information (3). Previous reports of rhabdomyosarcoma metastases to the breast (1, 2, 3, 12) demonstrated that a poor prognosis despite treatment, and relapse of this aggressive tumour, was observed in most patients (Table 1). Early diagnosis is recommended when suspicious lesions are detected in patients with primary rhabdomyosarcoma. Although immunocytochemical studies are definitive (14) and may be necessary in some cases; breast MRI with diffusion-weighted imaging is a useful non-invasive diagnostic tool that may help avoid the need for biopsy in cases with a high clinical suspicion of breast metastasis. The authors gratefully acknowledge the technical support from the UM research imaging centre (UMRIC), and would like to thank Prof. Dr. Wan Ariffin, Prof. Dr. Nur Aishah, and Dr. Nazri Md. Shah for their contributions to this case report. Authors’ Contribution: CDA, KR and AV drafted the manuscript. CDA, KR, AV and JP edited the contents and approved final version for submission. Funding/Support: Dr. Kartini Rahmat received funding from these institutional grants: RP008B-13HTM and RG390-11HTM.